Rookie Matthew Wedman scored 7:52 into the second overtime to lift the T-birds to a 5-4 OT victory over Kelowna and into the Western Hockey League finals. KENT – The celebration can finally begin for the Seattle Thunderbirds. 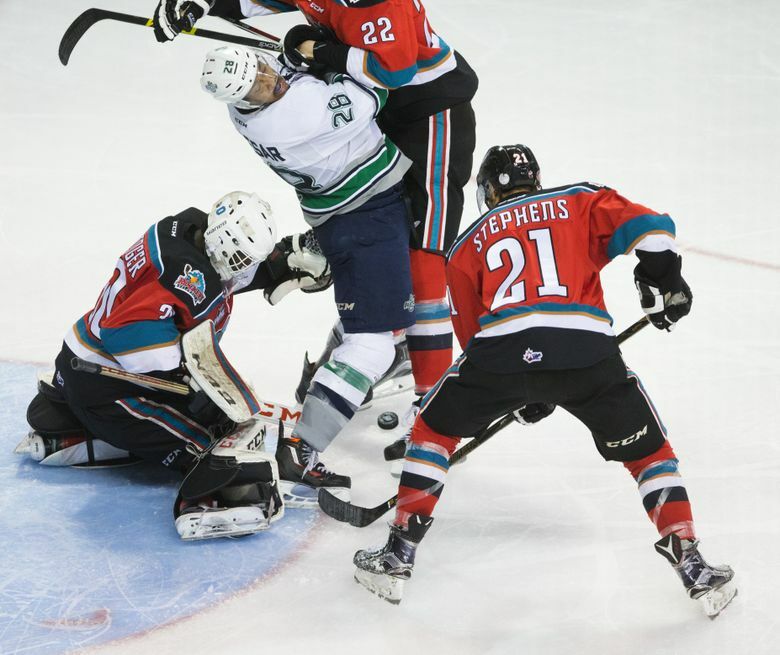 Matthew Wedman, a 16-year-old rookie, beat goaltender Michael Herringer 7:52 into the second overtime to lift the Thunderbirds to a 5-4 victory over the defending champion Kelowna Rockets and a 4-0 sweep of the Western Conference finals. Wedman, who did not play a minute in the first overtime, showed his fresh legs when he drove wide and tucked the puck to finish off an epic comeback for the Thunderbirds, who are making their first trip to the Western Hockey League finals in 19 years. Although Wedman’s goal won it, it was the way the Thunderbirds got to overtime that makes this game memorable. Seattle scored twice in the final two minutes to force overtime at 4-4. The Thunderbirds finally broke through against Herringer, who had made 42 saves at that point, to give the Rockets a 4-2 lead late in the third period. The T-birds scored on their final two shots of regulation, both with goaltender Landon Bow on the bench, to send the game into overtime. Ethan Bear scored his second goal of the game to pull the T-birds to 4-3 with 1:45 left. Keegan Kolesar then knocked in a rebound with 2.7 seconds remaining to send the game into an extra period. Herringer finished regulation and overtime with an incredible 71 saves to keep Kelowna in the game. The comeback came after Kelowna built 2-0 and 4-2 leads and Herringer appeared to be unbeatable. Wedman, a rookie from Edmonton, had six goals and eight assists in the regular season and now has one goal he’ll never forget and two assists in 12 playoff games. Seattle will now play the winner of the Brandon vs. Red Deer series, which Brandon leads 3-1. Since Red Deer is the host of the Memorial Cup, if the Rebels come back and win the series the T-birds will automatically be into the Memorial Cup. Seattle blasted away with 12 of the first 13 shots in the game as Kelowna appeared slightly disinterested. The Rockets then scored on their first real chance when Rodney Southam, fresh off his two-game suspension for a hit on Cavin Leth, scored on a 3-on-2 after an assist by Cole Linaker. Only 25 seconds later, Tyson Bailie doubled the lead after an assist from Dillon Dube. It was a remarkable turnaround for a Rockets team that had been thoroughly outplayed and outshot over the first period and a half. Seattle outshot Kelowna 16-8 in the period, but trailed 2-0. The T-birds didn’t take long to cut the lead in half. Ryan Gropp scored his third of the playoffs 46 seconds into the period after a perfect assist from Scott Eansor. The Rockets regained the two-goal advantage on a goal by Justin Kirkland, his 10th of the playoffs that came after Seattle failed to connect on several good chances on a power play. Seattle then relied on the magical skating of Mathew Barzal to cut the margin back to a single goal. Barzal skated behind the net for several seconds before finally finding Bear at the point. Bear scored his fifth of the playoffs to cut the margin to 3-2. The Rockets then added what looked to be the game-winning goal on Kirkland’s power-play marker at 13:50 of the their period before Bear and Kolesar scored to send the game to overtime.